I have a wonderful, decorative bookshelf that I bought in Korea when I lived there. I bought it when I was married without children, and had it in the living room to display various knick-knacks, souvenirs from our travels, and other decorative items- you know, all the stuff that no sane parent keeps in an accessible place when they have young children. In our previous apartment (where we lived when the girls were 18 months- 3.5 years old), I kept the bookshelf in my bedroom with a few things on it, but not much. 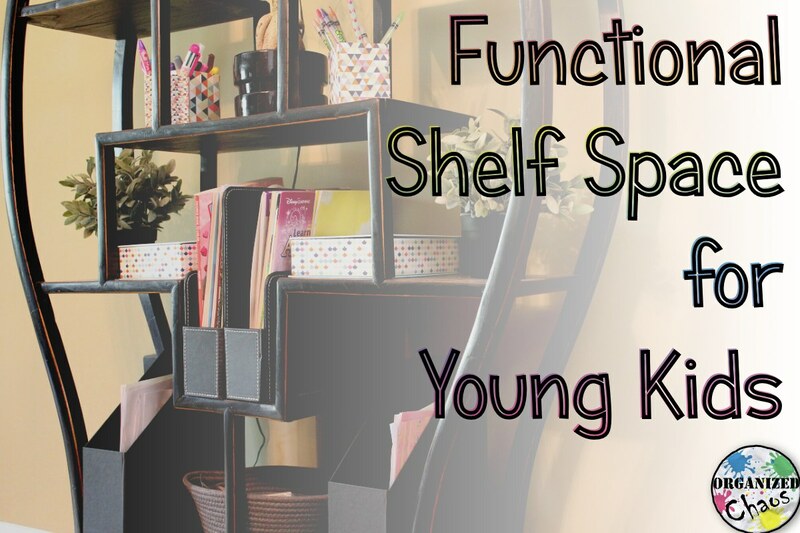 I didn't even want the shelf itself to be in an accessible place, because it is not sturdy and would easily topple over if little hands tried to pull up on one of the low shelves. I cannot take much credit at all for this idea. My mother was the one who brought up one of the biggest issues with a knick-knack shelf: dust. I do NOT have time to be constantly dusting this thing, and when you have purely decorative items that never get moved, especially a bunch of small ones, you are setting yourself up for pure dusting hell. Nope, not doing that. Then my aunt suggested something she had set up when her kids were younger: an art / homework supply area to give the kids something to do near the kitchen. I already had an art area set up in our basement so I hadn't thought to put anything upstairs, but her prediction was correct: most of the time, if I'm cooking or cleaning in the kitchen (as happens most evenings), they want to be near me! Setting up a second area with some supplies to keep them entertained so they can be close by without being constantly under foot in the kitchen is pure genius, people! Since I have a small pass through between my kitchen and dining area, the dining room table is a natural spot for the girls to hang out while I'm cooking. 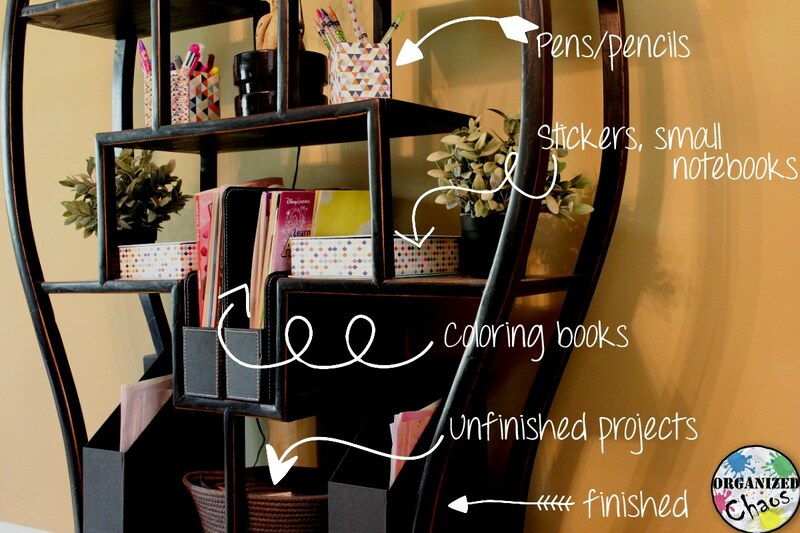 I set up the shelf next to the dining table and set out to find storage that would still look good on the open shelves while providing easy access to art supplies for the girls. Most of my storage ended up coming from IKEA (I know, big surprise). Since the shelf is very dark wood, I knew I wanted mostly black to blend in, but I was also hoping to find some colorful items to give the shelves a bit of a playful vibe. I found my color in these boxes and these pencil holders, and found my black/dark items with this magazine file/caddy and these magazine files. The caddy was a great find because the girls can pick up the whole thing and take it to the table if they want, and it perfectly fits the tall, narrow space I had on the shelf. I also picked up a dark grey woven basket on clearance somewhere... I think it was Michaels.... to go in the middle of the bottom shelf. I did manage to fit in a few other things besides art supplies to keep it from looking too cluttered and make it look a little more grown up. 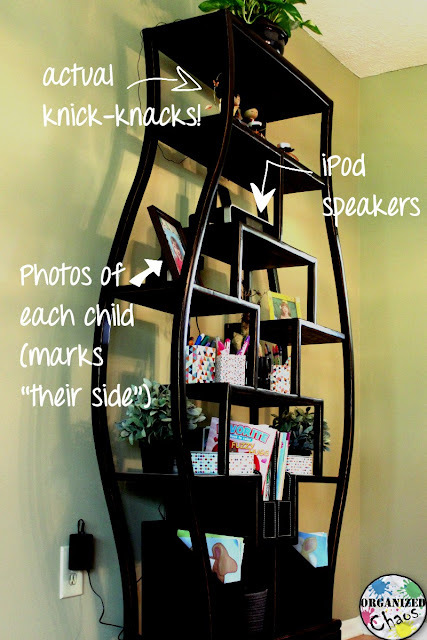 The only real knick knacks are on the top shelf, where no curious little hands can reach them (at least not easily). I also put some music on an old iPod and set it on some speakers, which is perfect for playing music while we're playing, and the photos of each child not only provide decoration but also serve to mark which side has their individual coloring books and completed art work (they each have their own magazine file, box, and side of the caddy). I love it when something functional is also nice to look at, and the girls are certainly getting a lot of use out of the supplies! My aunt was right: on weeknights especially, they almost always end up at the dining room table coloring (when they're not helping me in the kitchen), and it is really nice to be able to talk about our day and spend time together without getting in each others' way. What are some ways your furniture has changed purpose since having children? I'd love to hear how you have adapted to fit the changing needs of your family!